Deep Ocean is an English version fish hunting game. It features all new underwater scenery, all new creatures to capture and new game features. The high quality graphics, which bring the scenes and characters to life, introduce a whole new element to the game. 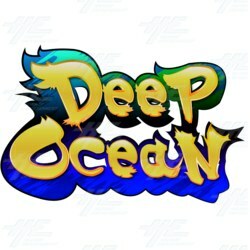 Deep Ocean follows the same format of other games in the popular fish hunting series where up to eight players hunt for characters using features and special weapons to gain the largest amount of points possible before time ticks down. The higher the points, the better the payout. Each game scene features a range of small fish (with low odds), high odd fish and big boss characters (worth the most). Players increase their scores by the number of characters they shoot during the game. The main Deep Ocean game play is layered with features, and there are special characters and weapons that can be used to help players increase their scores. Deep Ocean is available to purchase as a complete gameboard kit or on an Arcooda 6 or 8 Player Fish Machine.